The Dickinson area has always identified the need to actively and aggressively investigate and prosecute narcotics offenses. No community is immune from the direct and indirect effects of a drug problem, but we feel proactive enforcement is our community’s best option for combating it. The Dickinson Police Department currently partners with the North Dakota Bureau of Criminal Investigation and other surrounding agencies to staff and maintain a narcotics task force. 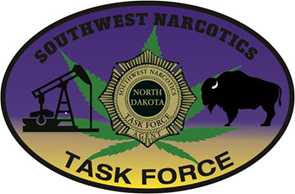 Together, agents forming the Southwest Narcotics Task Force conduct counter-drug operations. Agents are specially trained in surveillance tactics, informant development, human trafficking recognition, and other skill-sets often accompanied with the drug trade. Many “low level”, “pinch-and-a-pipe” arrests can be developed into an extensive investigation that nets primary distributors on a regional and national level. The ultimate goal is to identify, arrest, and prosecute mid-to-high level drug traffickers, especially for drugs that can be especially harmful to a community like heroin and fentanyl. At the height of the oil boom, the importance of the SWNTF was paramount, as well as the partnerships they developed with federal agencies like the Drug Enforcement Agency and Federal Bureau of Criminal Investigations. As a result of this coordination and partnership, many high-level arrests were made, and helped stemmed the tide of the influx of narcotics to the area. While we realize that drug demand will likely always be present, the efforts of the SWNTF are vital to keeping the quality of life of our community as strong as possible.